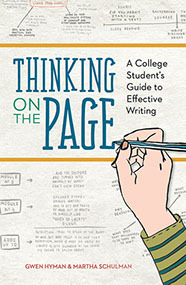 || Thinking on the Page is a writing guide for writers who don’t think like English majors. We wrote Thinking on the Page because, as experienced college writing teachers, we know most students don’t think like English majors. These students often think they’re “bad writers.” But they’re not: they just don’t have tools that work for them. That’s why we developed hands-on, visually oriented reading, writing and editing methods that make sense to all kinds of students. Thinking on the Page is a step-by-step guide to the writing process. We take you through every stage of academic writing, from the basics of reading for summary and analysis, through finding questions, analyzing, and drafting, right up to the polishing stage. We’ve field tested every piece of this book with students, so we know these methods work. Thinking on the Page is loaded with drawings, charts, outlines, and other materials that illustrate our hands-on method of essay writing. We explain everything in a clear, straightforward way, with lots of examples—and we don’t talk down to readers. If you’re looking for tools and methods that let you write without constantly getting stuck, this is the book for you. And if you’re a teacher who wants approaches that work for all your students, Thinking on the Page is the writing guide you need.